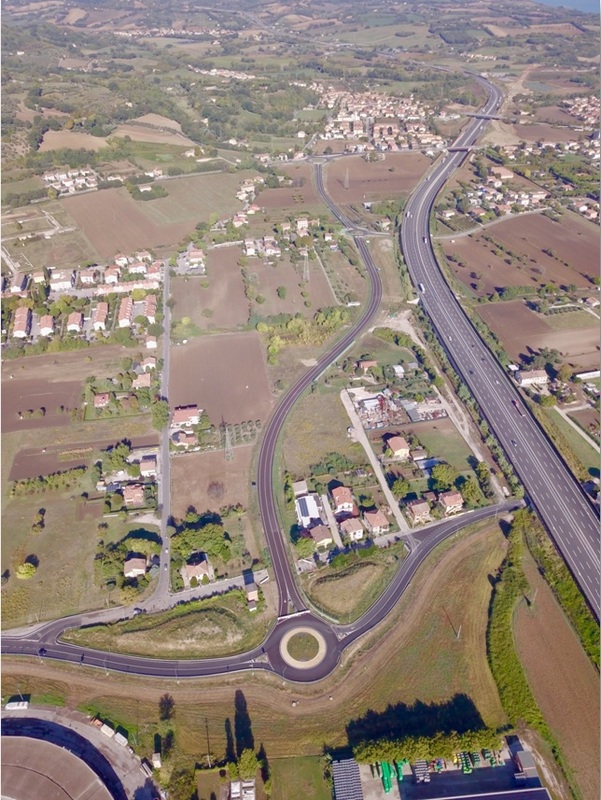 The project establishes the connection between (Paved Road) SP3 Flaminia and via Tommaso Campanella, the main local road network. The link road is composed of two branches with a total length of about 0.9 km. 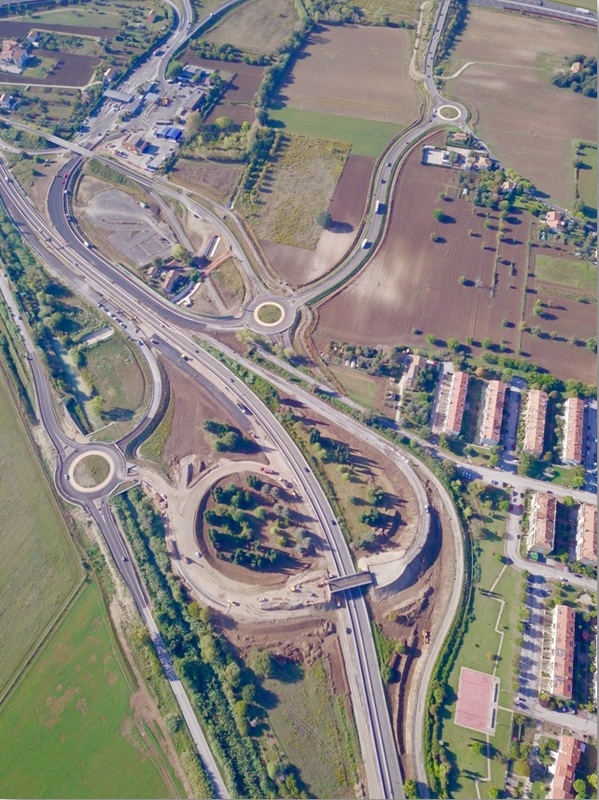 The project involves the upgrading and improvement of the existing junction node between the State Road 73 bis (E78) Fano - Grosseto, the existing Fano junction and the local road network, through the integration of the system with new branches of connection and roundabouts. There will be 4 new roundabouts and related connections, partially newly built and partially redesigned. In landlocked area is expected, moreover, the construction of parking spaces. 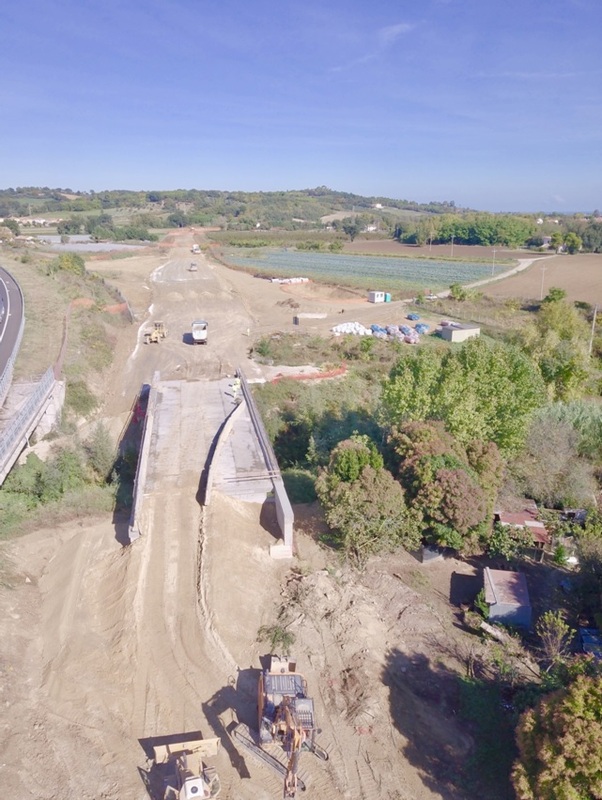 The viaduct consists of two metal beams with a constant height of 1.6 arranged with a cross-sectional distance of 7.0m. The insole, with a variable thickness of 25 cm on the 38 cm overhangs on a decking axis and a total width of 11.90 m, has a width of 10.50 m and two 0.70 m lateral curbs. 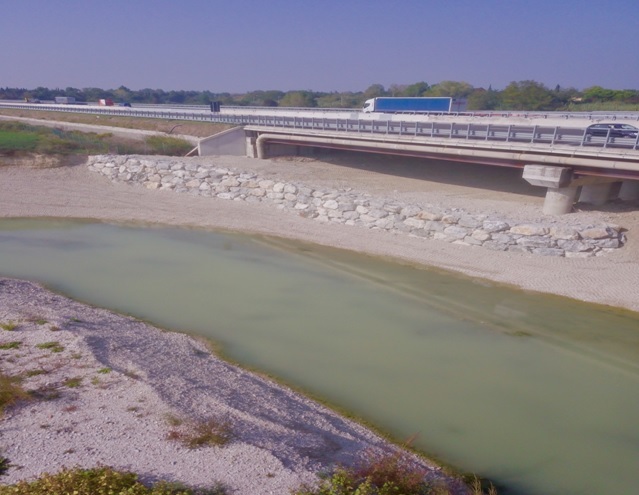 The work is carried out by a girder simply supported in steel structure composed of light concrete equal to 32.0 m.
The viaduct consists of a mixed steel-concrete structure with a static pattern of a continuous beam with 11 span bays equal to 32.7, 33.5 x 8, 46.90 and 33.5 m. The total deck width is 11.9 m.
The insole has a variable thickness and is made with in-situ casting through the use of self-supporting floor slab, resting on the upper flanges of the beams. The connection between the metal structure and the reinforced concrete slab is made by means of Nelson-type connectors welded to the upper wing of the metal beams. 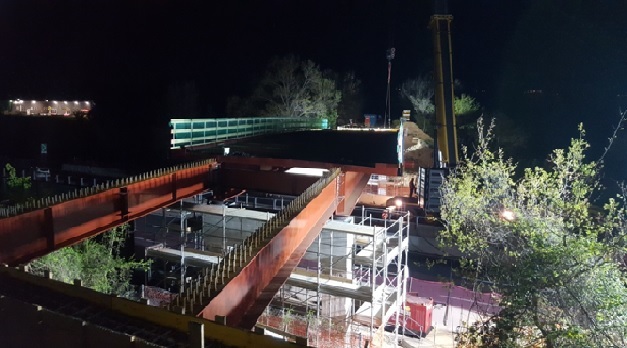 The girder is equipped with a system of bracing elements for the assembly phase and is made using segments with a maximum length not exceeding 15 m.
Located at the progressive 235 + 806.54 km of the A14 highway the overpass, represents the highway overpass of the provincial Loretana road. 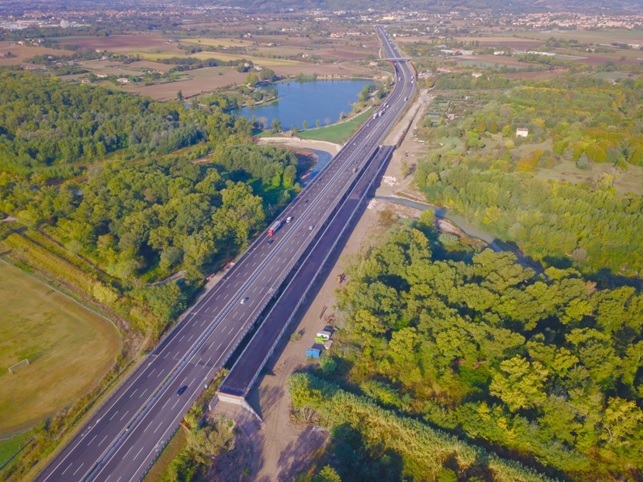 The overpass, with a total length of 61.50 m, is made up of 3 bays, of which 2 of the shore are characterized by a calculated gap span of 11.65 m, and a central span of 37.40m. 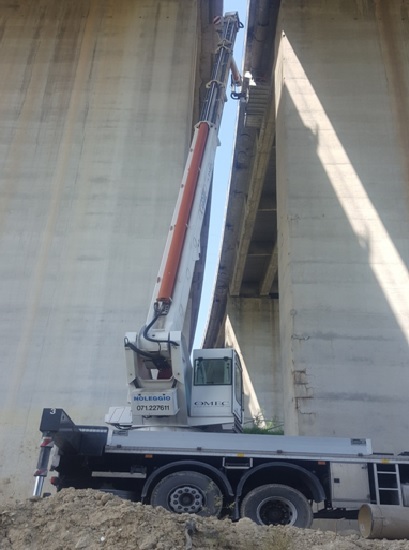 The intervention solution provides for the removal of the concrete beams currently resting on the gaps and the construction of a new concrete steel girder formed by a central span of characteristics similar to that of the first plant, from which stand out, by means of the insertion of a pivot articulation, the two shore bays, also made in structure composed of steel concrete. In the road section between the pk 265+100 and the pk 268+410, called Corva gallery, there are 6 major works of art that have been enlarged and include a drainage system for the platform waters which, through drains or louvres placed at the edge of the carriageway, are delivered in a longitudinal manifold anchored to the intrados of the cantilevered deck. 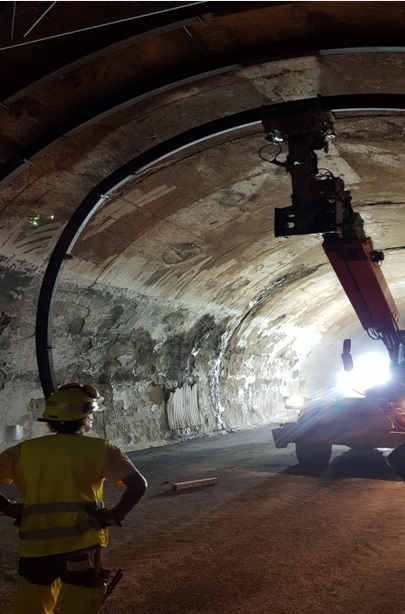 Intervention of safety measures and restoration of the damaged parts following an accident on the A14 Bologna - Bari - Taranto highway at the progressive pk 300+000 of the south carriageway of the Grottammare castle tunnel. 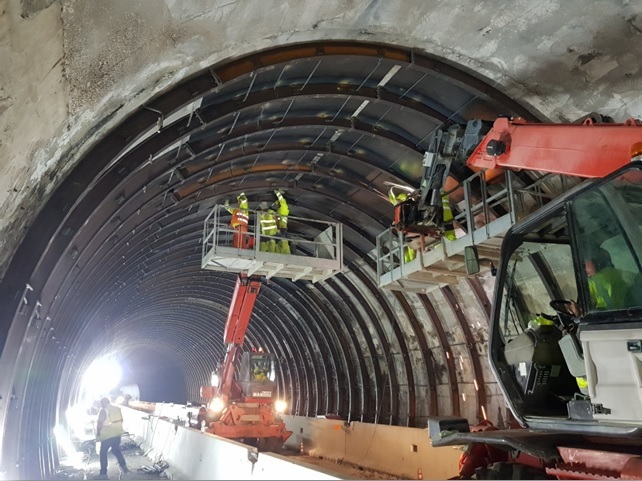 The project for the safety of the tunnel provided for the reinforcement of the cap with IPN ribs 200 positioned at distance of 1m, welded to a plate L of 60x60x5 size, connected by chains 24 mm in diameter. 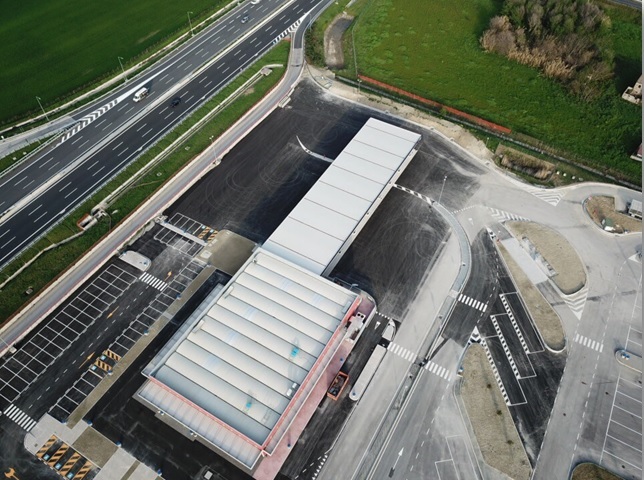 The intervention in the Metauro Ovest Service Area, located in the Municipality of Mondolfo (PU), concerns the construction of the block and the pavement structure and urbanization works. Intervention of hydraulic arrangement consists in the construction of a cliff, with cyclopean boulders, in order to counteract the erosive action of the Metauro river. The cliff was created by providing a series of stones, of appropriate size, positioned with the purpose of blocking the effects of erosion by the river on the shoulder and on the existing stack.